A huge explosion rocks the city of Seville, destroying an apartment block and a nursery school, in a residential area of the city. Detective Inspector Javier Falcon is charged with determining the cause of the explosion but when it comes to light that there was a mosque in the basement of the building, he learns that the anti terrorism police are running a parallel investigation. Predictably, the two investigations come into conflict with the specialist forces refusing to show everything they know with their civil counterparts. Were the men killed in the mosque caught by their own bomb, or are they victims of a hate campaign by people hoping to fuel the post 9/11 tension between Spaniards and North Africans in the city? While the anti terrorism squad keep Falcon and his colleagues out of the picture with regard to many details of the investigation, Falcon himself is asked to help in a different way, one that could endanger a family member. At the same time, Falcon is trying to put a name to the badly mutilated body of a man found dead on a Seville rubbish tip, and deal with his own complicated private life. To make matters worse, when his ex-wife, Ines, now married to the city’s Chief Prosecutor Esteban Calderon, pays him an unexpected visit, he is not able to recognise her cry for help. This is the fourth book in the series featuring Jefe Inspector Javier Falcon and it sees a subtle shift from crime fiction to thriller. Previous novels have seen Falcon lead the investigations, coming to his conclusion by way of solid police work, but ‘Hidden Assassins’ is different in that it sees Falcon more removed from the core of the enquiry, destined to be a pawn in someone else’s investigation. The interplay of the two agencies – the anti terrorism squad and the civilian police – provides plenty of dramatic tension. Falcon is hardly unusual in the field of crime fiction. Like so many detectives he comes with baggage; he has to work closely with Juez Esteban Calderon, the man his wife had an affair with, and he is still coming to terms with the fallout from his father’s death. “Hidden Assassins” does reference events of the previous Falcon novels but it’s easy to pick up the background and, for those who have read the others, there isn’t too much repetition. He’s a likeable but complex character and, having read all of the Falcon novels so far, to keep learning new and interesting things about him is much appreciated and keeps the overall story fresh. 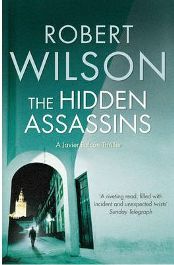 Robert Wilson is British but lives partly lives in Spain; one of the things that is quite striking about the Falcon novels is that he writes about Seville and Spain in general as if he himself is Spanish, not making that error that many writers do of trying to hard to impart a sense of place and culture. He doesn’t feel the need to make gratuitous references that teach the reader something about location, but you do get a strong sense of place nonetheless and that comes through from things as mundane as the daily routines and lifestyles of the characters. As a thriller this is first rate stuff; false starts, dead ends, political intrigue and espionage, it has it all. The middle section of the story suffers a little from a glut of characters that are difficult to distinguish from one another, forcing this reader to continually flick back for a reminder. That the action takes place over a relatively short period of time adds to the dramatic tension which is heightened by the descriptions of the intense heat of Seville in summer, evoking an oppressive environment. ‘Hidden Assassins’ is a window not only onto contemporary Seville but a reflection of much of Europe as it struggles to balance immigration with security. Wilson poses some interesting ethical questions but, like his clever evocation of place, these are knitted easily into the narrative and are very subtle. This is a novel to get the little greys cells working even if it’s not quite in the way that the Falcon novels started out; here it’s a combination of working out how the explosion happened and much bigger political and philosophical questions. My only criticism is that the side plot that focuses on Falcon’s ex-wife is unnecessary and doesn’t add anything to the main story. It does continue the thread from the previous novels but other than that its inclusion seems gratuitous and only serves to extend what is already a fairly lengthy book. Although this novel can be read alone outside the series, I am so enthusiastic about Robert Wilson and the Javier Falcon novels in particular that I would encourage anyone interested to read the series from the beginning. Should you choose not to, I’m pretty sure that reading this novel as a stand alone will persuade anyone to seek out its predecessors. No Comments on "The Hidden Assassins"